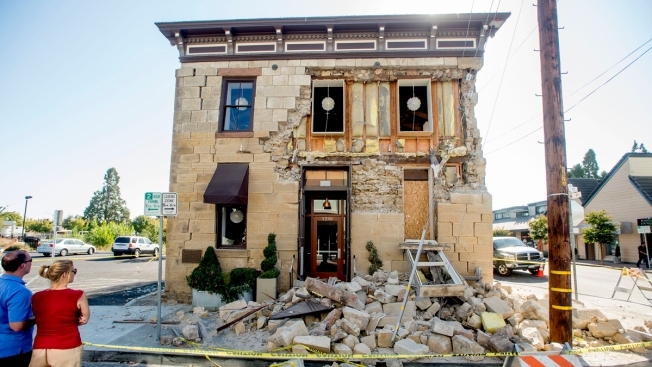 Pedestrians stop to examine a crumbling facade at the Vintner's Collective tasting room in Napa, Calif., following an earthquake Sunday, Aug. 24, 2014. 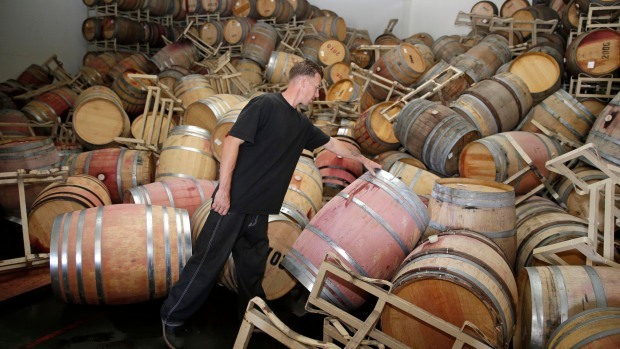 Officials in the city of Napa say 15 to 16 buildings are no longer inhabitable after Sunday's magnitude-6.0 earthquake, and there is only limited access to numerous other structures. Had communities across California – including Napa – not had a program to reinforce older buildings, Sunday’s early morning earthquake likely would have damaged many more buildings, officials said. Bricks and mortar fell when the 6.0-magnitude earthquake hit, but there were no fatalities and of the more than 200 people treated for injuries, only three were critical. The timing of the earthquake, at 3:20 a.m. when few people were around, also worked to keep the number of injuries down, he noted. If it had occurred at 11 p.m. instead, for example, there would have been customers at restaurants and bars, and the debris that fell to sidewalks would likely have caused injuries, he said. “However, if you look at the inside of the buildings, we do not see any catastrophic collapses,” he said. At a press conference Monday, Napa’s director of community development, Rick Tooker, said it was too soon to tell if the program had been successful. Buildings were still being canvassed for damage, he said. California has adopted stricter standards for new buildings following past earthquakes but many older unreinforced masonry buildings remain vulnerable. Some cities have required extensive improvements. Los Angeles mandated that all of its brick buildings be retrofitted, while San Francisco implemented a local ordinance after the Loma Prieta Earthquake in 1989. “The program is more than 10 years old and I believe hit a 95 plus percentage completion rate,” said William Stawn, a spokesman for the San Francisco Department of Building Inspection. Berkeley also has done extensive work in term of earthquake preparedness, but many other communities have done little in comparison, said Mary Comerio, a professor in the University of California, Berkeley, graduate school of architecture. Red Cross officials say while it's important to be prepared before a quake or emergency, the flood of calls is still a good thing. Officials stress everyone should have a plan and create an emergency kit. 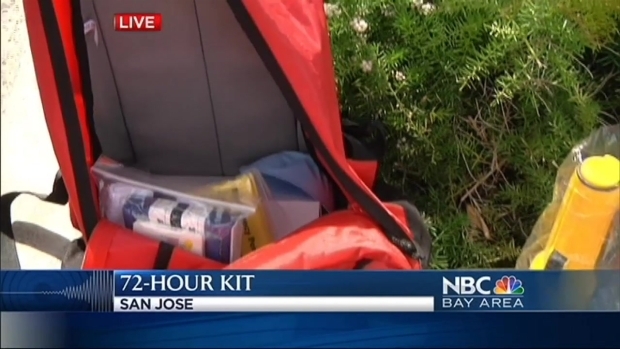 The kit should contain at least 72 hours worth of food, water and other rations. Those living in rural areas should consider having rations to cover a longer period of time. Visit RedCross.org for more information or redscrossstore.org to purchase a kit. Remember to add vital medicine and other documents you may need. Derek Shore reports. Communities have had other priorities particularly in times of tight budgets, she said. Strack said communities themselves needed to decide what amount of retrofitting they would require. In some cases, brick walls are attached to ceilings and floors, in others, the strengthening is more extensive, for example building a steel structure inside the brick, Strack said. But even buildings that have been retrofitted may still be damaged in an earthquake, and may not be salvageable, he said. “But if we didn’t lose any lives and people weren’t injured when they occupied the buildings, to me that’s a success," he said. Retrofit standards as they were designed in the 1980s were meant to keep the buildings from collapsing and killing people, not to save the buildings for the future, Comerio said. 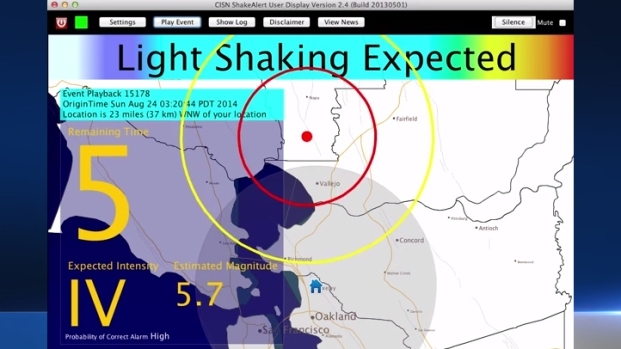 University of California, Berkeley, scientists say an early-warning system gave them a 10-second alert when a 6.0-magnitude earthquake struck southwest of Napa early Sunday morning. Michelle Roberts reports. For private buildings, owners are bearing much of the responsibility of the retrofits, she said. Communities could look at programs to help, whether by allowing owners to pass along some of the costs to tenants of apartments or some kind of tax breaks, she said.